* It is an honor to be performing American National Anthem in the presence of American and Turkish ministers and consulars. *Temi is thrilled performing on this magical Speakeasy Theatrical Concert Night with Anna&Kate Band. 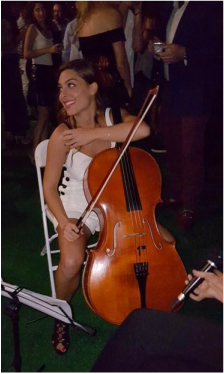 * Temi performed at a special rooftop event combining House Music with Cello. 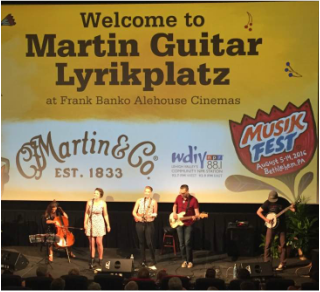 Temi is thrilled performing on this magical Speakeasy Theatrical Concert Night with Anna&Kate Band. * Check out Temi's interview on 42nd Street Magazine! 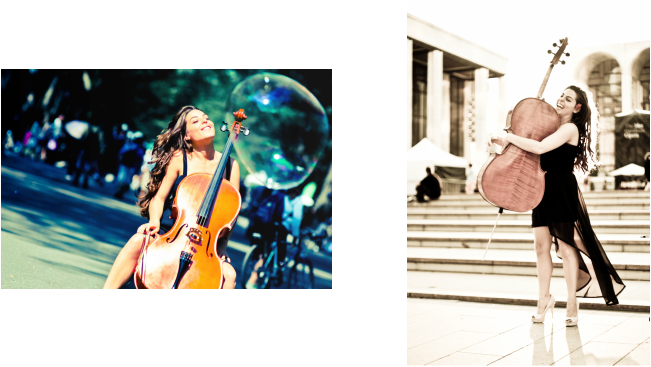 * Temi is thrilled to be a part of Anna/Kate Band.Adding Cello parts to the wonderful original folk/pop music. * Watch Temi's interview at the only Turkish Channel in USA. * Join us at the Cabaret Performance written and performed by Temi Hason. Where she will be telling stories, singing songs and playing Cello! You will find a piece from yourself! *After the wonderful performance at Owls Hoot Barn with Anna/Kate Band, where they have performed original folk-pop songs. Temi is a proud founder of 'A Musical Home' which offers custom made music lesson for children from 4 months to 5 years. 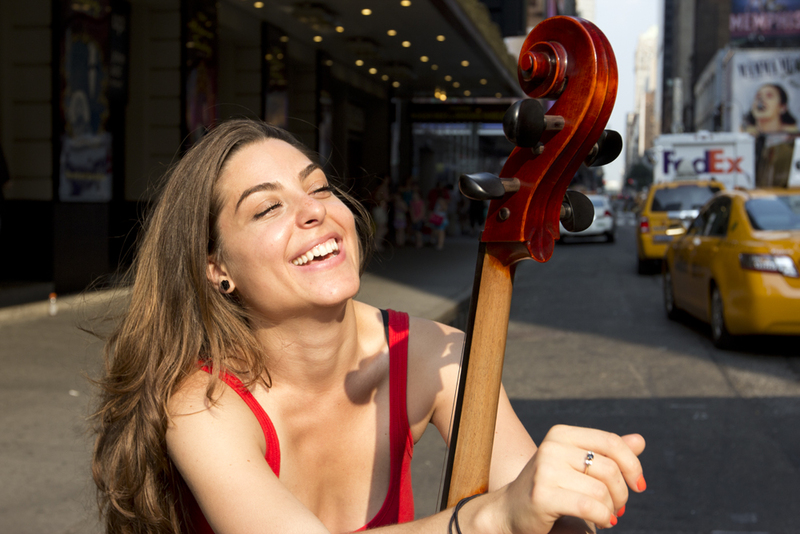 She is honored to make the Cello parts come alive! 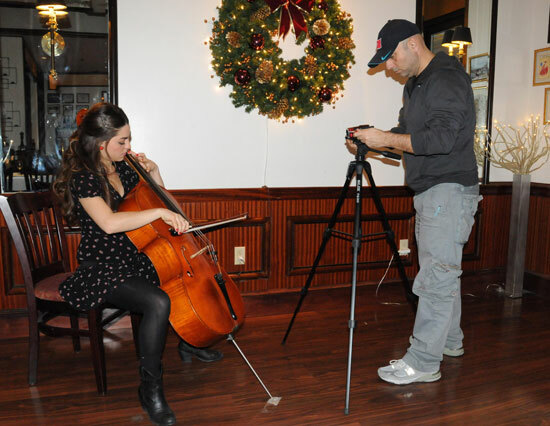 *Here is a pix at Judson Memorial Church from our Performance with Ann&Kate. It is amazing to share the stage with this amazing team! Stay in tune to hear some awesome song and performances! * Temi has taken part in 'Greek Legends' where she has been talking about the yogurt tales from Turkey in both Turkish and English. *InstaPet is a new app special for Pets featuring Pet Ambulance, Pet Transportation, Pet Food, Dog Walking, Training and many more..
Temi was the 'Casting Director' for their commercial. 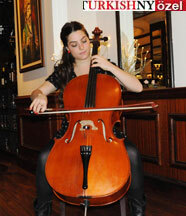 * Tango is a new video game designed by 'High5Games' that Temi has take part in as an actress and as a Cellist. You can see her character as a cartoon style and hear her Cello playing in the recording. 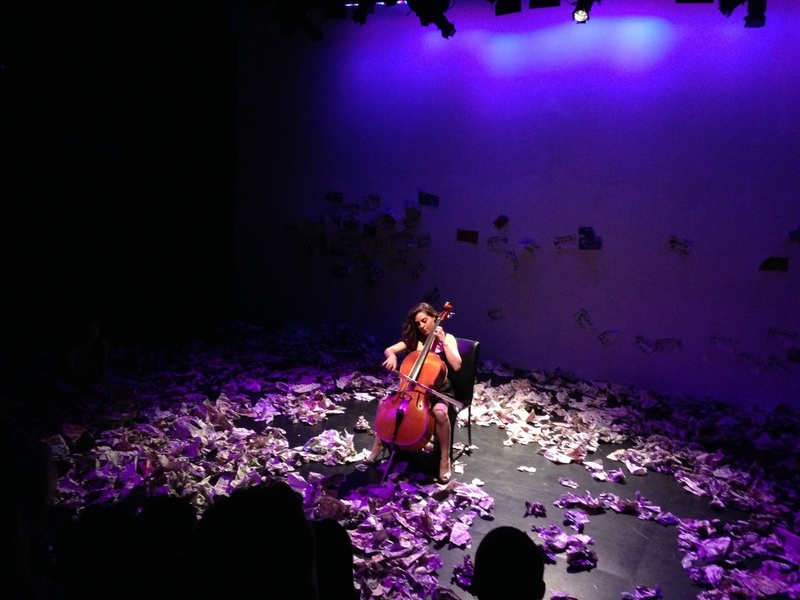 * Temi has performed as a Cellist in the amazing rock musical 'Spring Awakening' at American Theatre Of Actors. Two years ago she performed in 'Spring's Awakening (the play) ' as an actress. 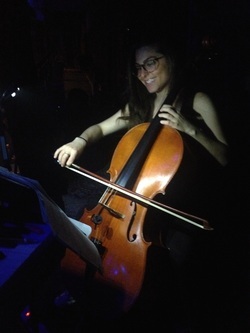 She is very happy to be working in the same show but the musical this time and as a Cellist! 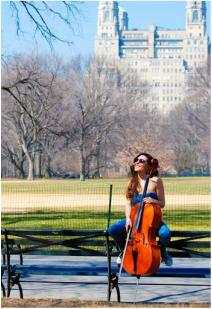 *Temi has returned to the set of 'Ovum The Movie' as a Cellist on April 15th 2014. *On January 26th 2014, Temi was on the set of 'Ovum The Movie' where she portraying a Hippie Girl. 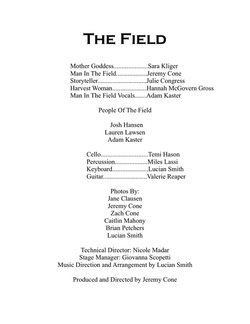 *Temi has performed as a Cellist in a new Musical 'The Field' at Under St Marks Theatre. 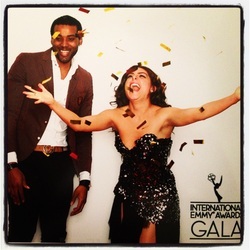 *Here are some pictures and her Red Carpet appearance at International Emmy Awards 2013. * The new edition of Broadway Weekly is out. * Here are the sneak peek from Temi's recent performance 'Tipping The Playpen' at Dixon Place. Click the link to see the video! * Be sure to Follow Temi's new column 'Broadway Weekly' on "Posta 212 Newspaper" to stay updated with what's happening in the entertainment industry in New York . 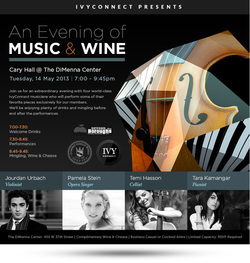 * On May 15th 2013, Temi has performed for Ivy Connections exclusive event 'An Evening of Wine & Music' at The DiMenna Center among with three other amazing musicians. 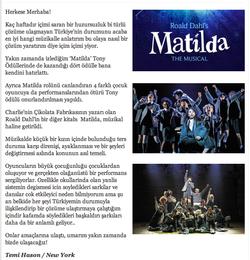 * Temi will be hosting a Radio Show 'Broadway Here I Come' at Radyo Turkum every Friday at 2pm. Tune in to hear some news about Musical Theatre and Classical Music. * 'My Life and My Songs' A Musical Theatre and Cello Cabaret Show written and performed by Temi has premiered in Turkey at 'Nina'. * The new Documentary 'Turkish Artist in New York' Temi was be out soon! It is a special project for her which she has dedicated to her Grandpa. *Temi recently had an interview with 'JRGON' check it out! 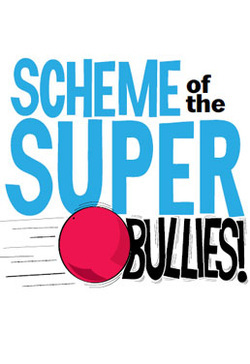 *Temi is thrilled to announce that she is cast in a new Musical 'Scheme Of The Super Bullies.' and will be performing at 'New York Children's Theatre Festival. 'For more details please click the link below. 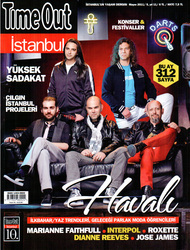 *Here is an article about the Movie DEPARTURES. 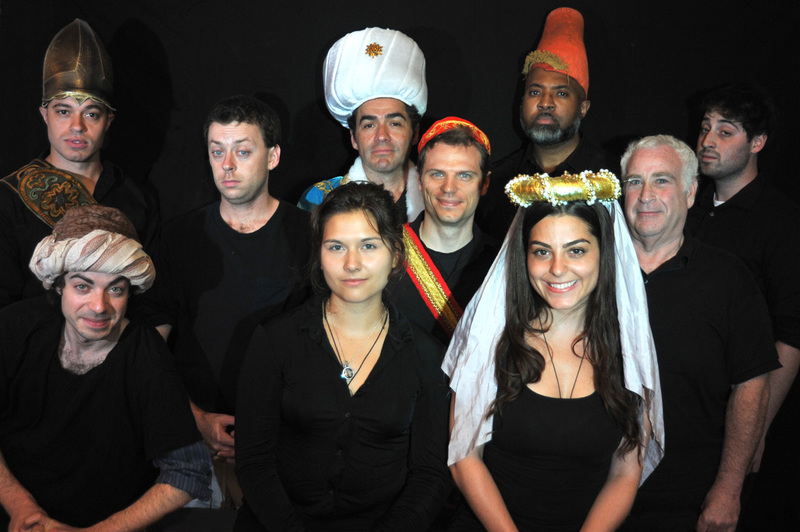 * Temi has joined Actor's Equity of Turkey. * Temi recently got cast in 'Something Outrageous'.She will be performing at 45th Street Theatre on October 15th, 22nd and 29th. 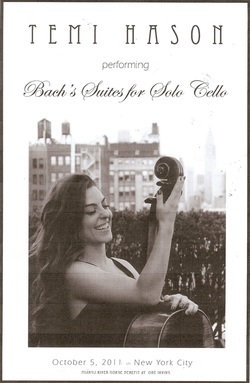 * Temi had a Mini Cello Recital performing Bach's Suites for Solo Cello. *Stripper Lesbians is accepted to Frigid Festival NYC! Temi will be performing as 'Aisha' the role she originated on February 22nd - March 4th. 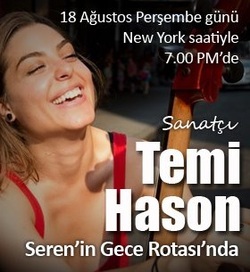 Temi Hason is gonna be the guest at Radyo Turkum with her success story on August 18th at 7 pm so don't miss Serenin Gece Rotasi. You will have a great time listening to our very sweet guest! *Temi is cast as the lead in the short movie 'Home'.More information coming up soon! *Here is the Trailer of 'Departures', where Temi was starring as one of the leading roles. * Temi is an Ensemble member of Rising Sun Performance Company.Check this out! * May 31st 2011, Temi will be originating therole 'Marianne' at the reading of 'Queen Of Hearts' by Kate Foster. 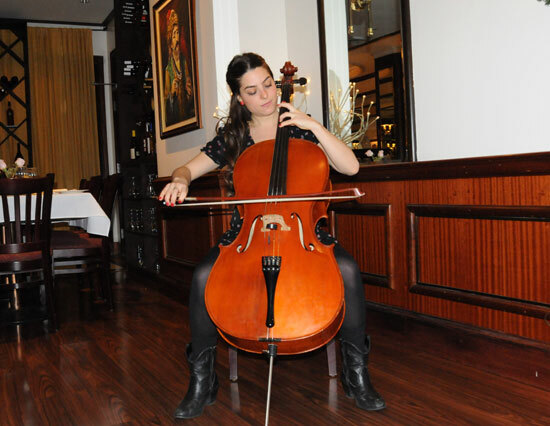 * May 15th 2011, Temi will have a mini resital with her Cello for The American Turkish Society 'Design As Cultural Link' event.